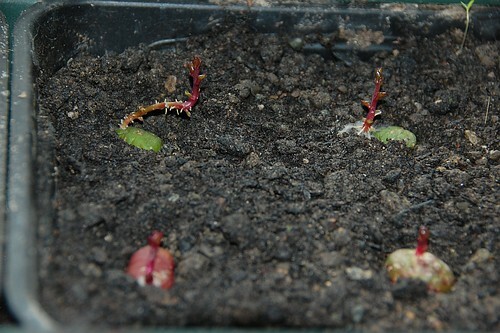 These are four little ulluco starts that I was sent in a swap earlier this year. As you can see they are strong stem rooters and part of my new strategy with these rather difficult to perfect tubers will be to earth them up deeply in September or October. I'm hoping this cover will hasten the initiation of the ulluco and provide extra frost protection for the forming tubers. My pessimism leads me to suspect that all that lovely loose earth over some delicious starchy roots will be a mouse and vole new starter home billboard and the problems will merely lurch into another area. I have some tubers of my own saving to plant too, but they're not started yet. Don't think it's too late but I'm beginning to get twitchy about the very late start to the season caused by the dreadfully cold weather. If we don't have a wonderful Indian summer then we're doomed. Horrible vandalism is a problem on many allotments. So sorry for people this happens to. A vegan recipe that I must try Vegan Basil Chicken although not everything this chef cooks is vegan. Renae is in Northern Virginia and has been eagle spotting.